When I saw the small point in the air, I was not interested at first, but a second later I noticed that it must be an eagle and my full attention was there. 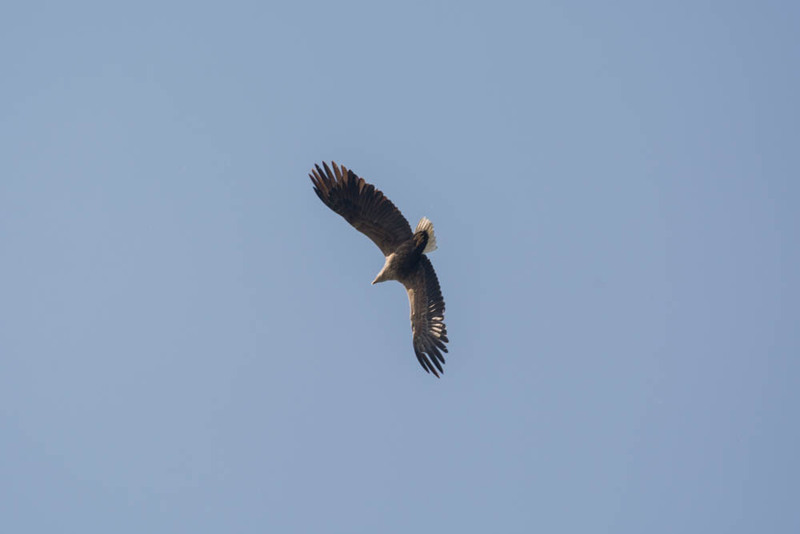 When I saw white-tailed eagles (Haliaeetus albicilla) in the past, they rather had a grey neck or they were completely brown, and when I saw my photos at home, I thought the bird also looked like the American bald eagle (Haliaeetus leucocephalus). However, I found out that the older white-tailed eagles look very similar, the younger ones not, and that the eagles like other birds can have different plumage. But then I have read that there were two cases of bald eagles gone astray, two sightings of this bird in Germany, so, you never know, unless you are a bird expert. Anyway, it’s probably very unlikely, and since older white-tailed eagles look so similar, it’s probably our domestic eagle. By the way, the white-tailed eagle is also called white-tailed sea-eagle in English, or just sea-eagle. In Germany we call them Seeadler, and that is basically also the literal translation of sea-eagle. It’s funny, I didn’t really expect to see one here where I am right now, I would have expected to find them somewhere else as mentioned earlier. But now that I saw one here, I hope that I get another chance on my next hike, even if it will be difficult to take a photo if the bird is too far away, but I’d like to have another chance! Well done to capture a photo of an eagle even if it was not the quality you would like. I think they would be one of the harder types of bird to photograph. We have eagles here too and I have seen them but usually from a distance. Yeah, you don’t see eagles every day, I think that is the problem, and the one you mentioned, the distance, unless they are sea-eagles and hunting fish, or other eagles that hunt mice… but then you need even more luck to see one hunting for food. 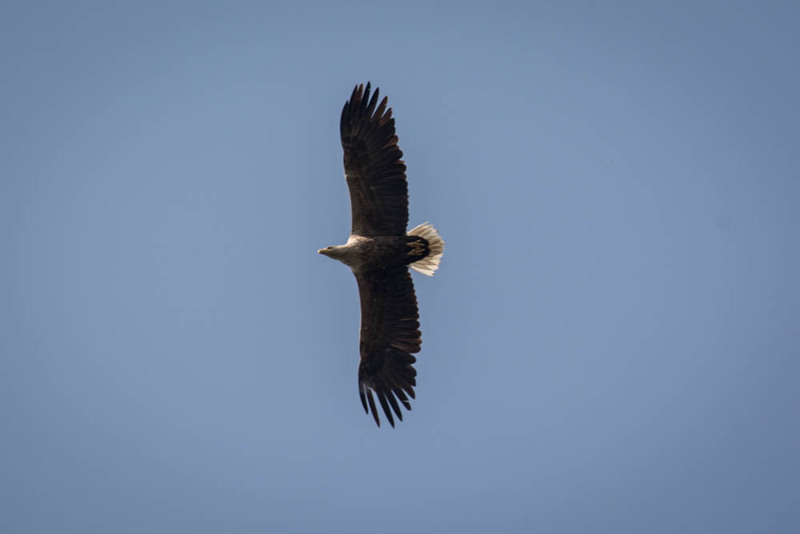 I got some tips and I have read about the local eagles… as soon as I am back in my hometown, I will hike through the Schellbruch, or drive to Travemünde, because there is the coast and it’s said that the chance is higher to see white-tailed eagles or osprey there. My grandparents said they do often see Osprey over the rivers in Ratzeburg, that would be another option, because I could stay for a weekend on their campground when I am not too busy anymore. 🙂 I hope that I can save enough money for a prime lens, I think I could purchase one next year, that would be fun, meanwhile I look at Ebay, maybe I can find a deal. It does look very much like an American Eagle. They are no doubt closely related. Our American Eagle is really a fish eagle (like the osprey), but of course much bigger than an osprey — but much smaller than the Golden Eagle. The biggest eagle I’ve ever seen, bigger than the Golden Eagle (which I saw up in the Golan), is the California Condor which IS an eagle, albeit misnamed. They are absolutely gigantic! Getting pictures of birds is so much a matter of being in the right place at the right time with the right camera and lens. You’ve gotten some great pictures. I have seen many many birds and gotten remarkably few pictures! The Golden Eagle looks very beautiful. I never heard about the California Condor and typed it into Google and will give the Wiki page a read, but searching Google images, I saw one image with a human and a California Condor, and yep, that bird looks gigantic! I once saw two bald eagles flying around in what looked like a mating ritual. Of course I did not have my camera. That is good news about the wolves.